The icon of the exotic honeymoon or romantic getaway is now much closer than Polynesia and South East Asia. Uber-luxury overwater bungalows have arrived in the Americas. Here are our new favorite places to sleep under a thatched roof with the sea lapping around you, where you can slip out of a gauzy, draped bed into the sea or your private pool-with-a-view. You'll be the envy of your social media circle when you post your travel pics of any one of these resorts with floating villas. Karisma Hotels and Resorts calls them the 'Palafitos': 30 luxury bungalows over Mexico's beautiful beach area of the Riviera Maya. 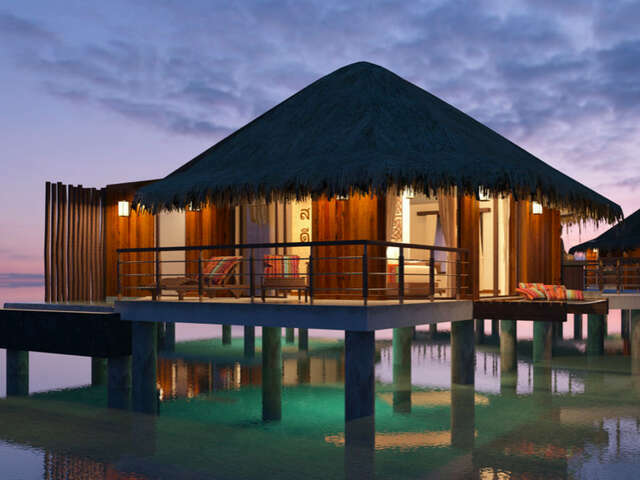 All the overwater bungalows include palapa-style roofs, outdoor showers, glass-bottom floors to the sea, private infinity pools, an indoor jacuzzi and direct ladder access to the ocean. Exactly what you'd expect of a luxury overwater bungalow. What makes them different is that they are said to be inspired by the ancient Aztecs who built homes over Tenochtitlan’s lake, and local design touches include Zapote wood and Mexican white granite. 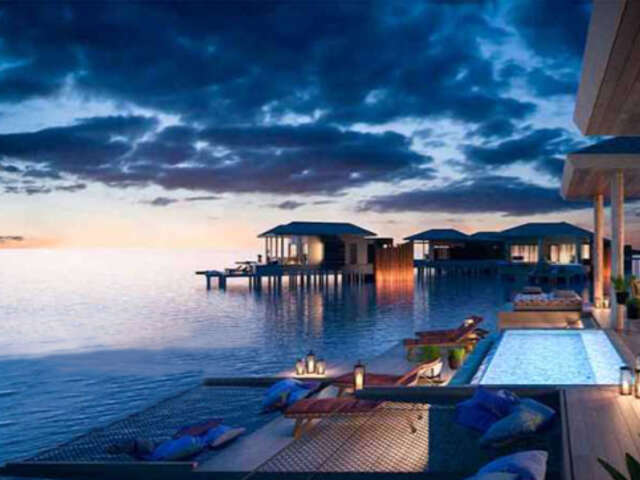 It's a luxe all inclusive experience that comes with an overwater restaurant, overwater spa, butlers, and concierges. Might be hard to tear yourself away for an expedition to nearby Tulum or an outing to Cancun. 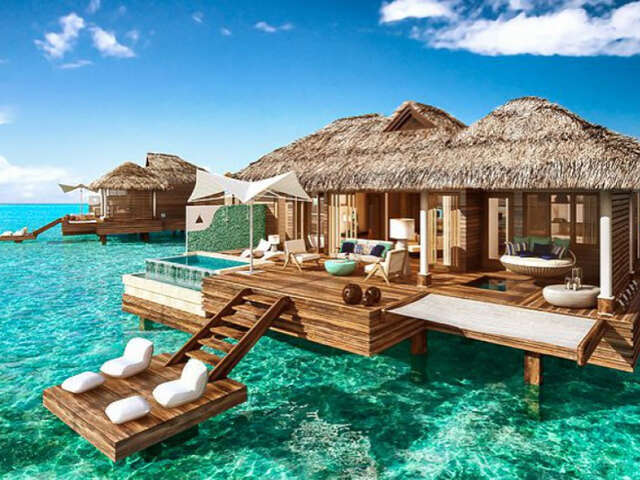 Five opulent, game-changing overwater villas make the Sandals in Montego Bay stand out of the Caribbean luxury resort scene. Floating decks /living rooms, his 'n' hers vanities, a glass floor, private infinity pool, a hot tub/spa with an outdoor shower, floating water hammocks that suspend over the sea and butler service put this resort experience on par with some of the best resorts in the world. The ultimate romantic couple's getaway, or the honeymoon of your dreams in an overwater bungalow is now just a short, and for many North Americans, non-stop flight to Montego Bay away. Bocas del Toro, Panama, is already known as an eco-travel destination. Its archipelago is home to critical wetlands, the most biologically diverse tropical coral reef in the region, and savvy travelers know it as an ideal place for bird watching, cycling, guided eco-hikes, snorkeling, and deep sea fishing. The Viceroy Hotel Group's 2019, exclusive overwater bungalows polish the luxury sheen of the glorious location. Over sparkling Caribbean waters at the edge of a rainforest along miles of pristine, private white sand beach, the property's 42 overwater bungalows feature their own private plunge pools and direct access to the ocean. The eco-friendly resort allows only electrical cars and sustainable technologies, and sustainable and indigenous landscaping and gardens to supply its chefs with the ingredients for local cuisine. Getting there is half the fun and feeling of exclusivity: it's only accessible by boat, seaplane or helicopter from Panama City.